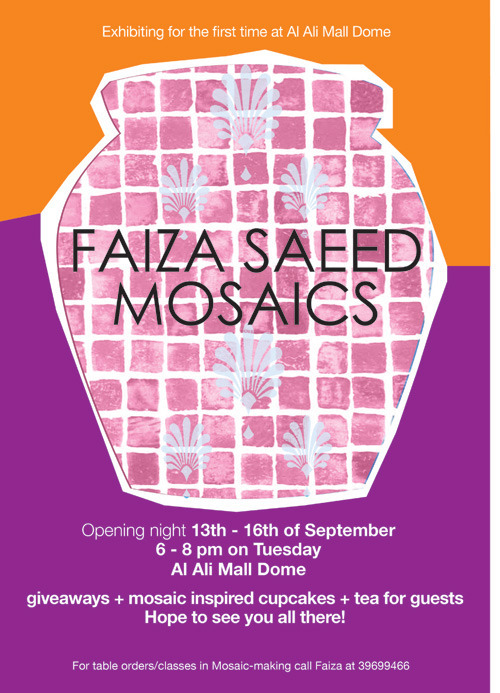 Exhibition – Faiza Saeed one of the first artists in Bahrain to focus on the craft of mosaic design will be exhibiting 150 tables, wall pieces, coffee tables, and pots, in her first showcase in Al Ali Mall. 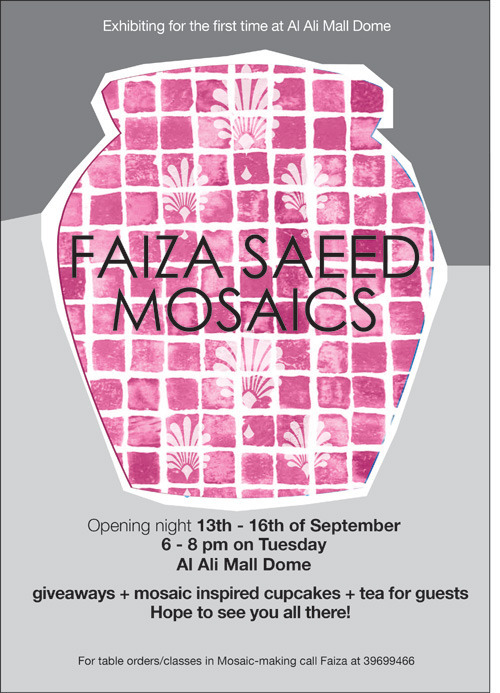 Join us for the opening where we will be serving mosaic inspired cupcakes + tea to guests! Feel free to bring all along friends and family. All are welcome! 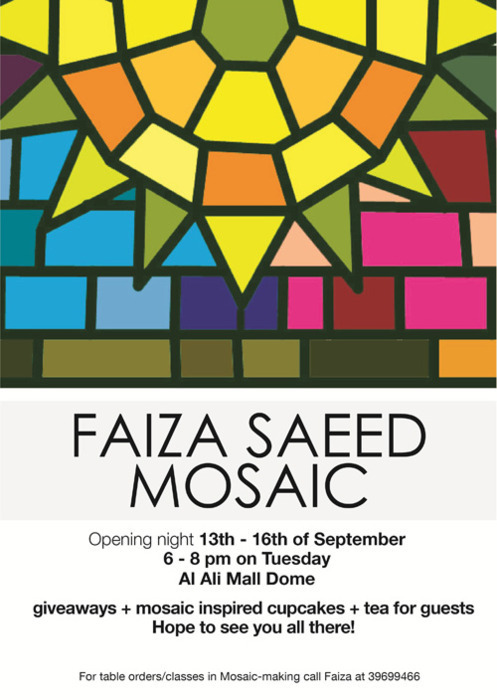 Bio – Faiza Saeed is the first mosaic artist in Bahrain. Faiza grew up with a passion for art having dabbled in painting and collage making she is mostly inspired by her brother the Bahraini artist, Abdulhameed Saeed. As a child she was exposed to his surreal paintings that went on to influenced her work. 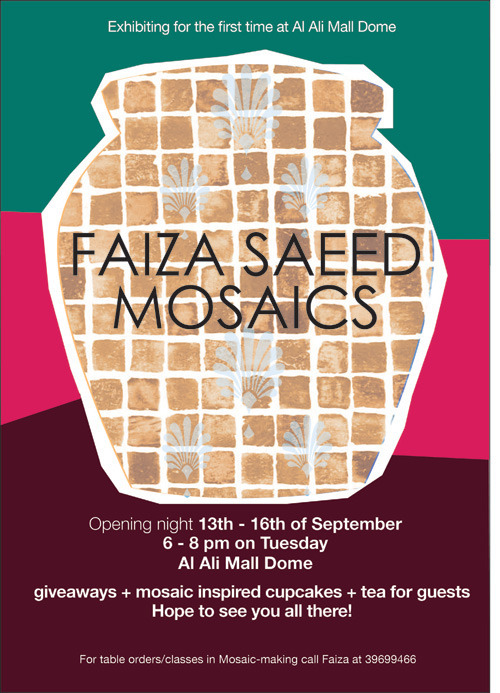 Faiza’s love for mosaics started from the moment she laid eyes on them when visiting museums in Britain, Italy, and Spain. She then went on to meet legendary British mosaic artist Emma Biggs taking lessons on designing and experimenting with the medium from her London studio. 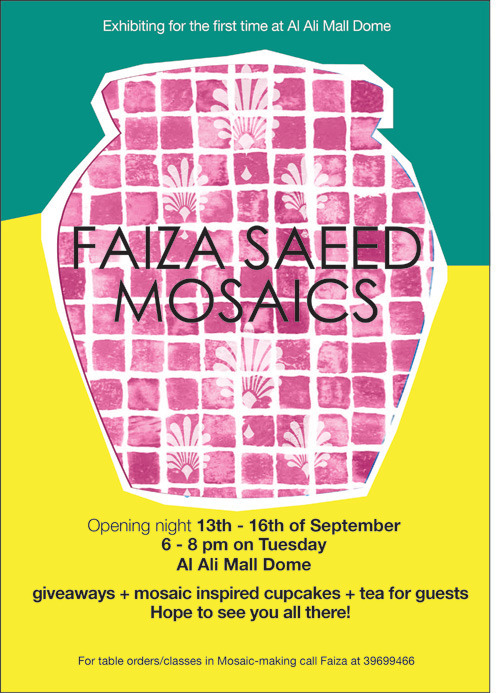 Faiza Saeed continues to experiment with Mosaics, first on tables and wall pieces, and soon will be building her first wall installation piece. Faiza continues to sell her work in markets, at exhibitions, and conducts weekly classes for beginners.